DTE Systems developed the PedalBox in order to improve response in modern cars. The PedalBox is an additional unit, with three user-selectable programs, that increases throttle response by removing delays in the accelerator, enhancing driveability. The PedalBox is located between the accelerator pedal sensor and the control module and works by capturing the accelerator pedal signal and modifying it. Many car manufacturers have a similar less effective method already built into their vehicles by utilizing a "sport button". The PedalBox reduces the pedal travel necessary to reach a "throttle wide open" state, which allows the driver to utilize the full potential of the engine much sooner. All drivers face a wide range of driving conditions and situations. The PealBox allows drivers to choose between three levels, each with three seperate modes offering improved response. The PedalBox includes different programs tailored to meet the most drivers range of driver's wishes. The driver can select the program most suited to the driving situation. Modifying the values set by the manufacturer has advantages. The PedalBox will meet the expectations of customers and their cars. The often delayed throttle response of modern engines is gone, while retaining the standard engine control unit. What a great company to offer support for a new owner of a pre-owned system. The dealership did not even know what it was. 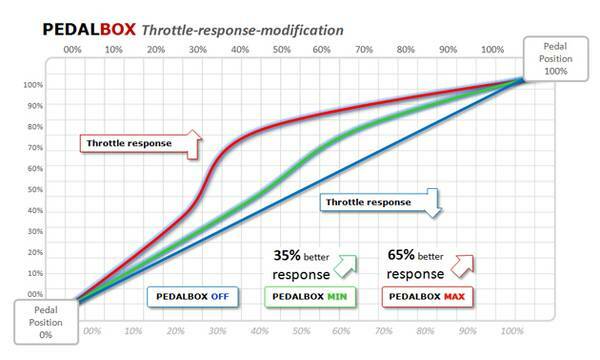 The pedalbox really makes a difference on your throttle response! sport mode gives your car a little extra push, and race mode makes a huge difference, literally almost no response time! After the installation, I took the car out for a test drive and ended up getting in to a race against a 2015 cadilac, and it was awesome! acceleration feels amazing, and it feels like it has more horsepower! Good product, good seller, fast shipping, great support. Tricky connector release. Works exactly opposite of the OEM connector. Recommend test fitting the two Pedalbox connectors to each other before connecting to car. Works well to overcome the dead spot in the GTI's throttle by wire. I thought the issue I had was throttle delay, but it is really poor pedal response and this helps immensely. The car drives differently than if you simply push the pedal harder and it's just as controllable as stock, but without that squishy lag-like pedal response. Even Eco is noticeable and a good "commuter mode". I have been frustrated with the slow response of the accelerator pedal in my BMW. This product dramatically changes the character of the car and makes it much more enjoyable to drive. I was shopping for a new car and thought I would try this first. I now love to drive the car. I have no idea why BMW sets the car up the way they do. I have also read skeptical comments on some BMW discussion boards. You cannot do what this product does just by moving your foot faster. I could push the pedal to floor and quickly release it without the car ever moving. This thing just works, don't listen to anyone who has not tested one. It's is a great product!